Jaded Blossom: Guest Designer, Melisa! I'm Melisa from Melisa's Crafty Creations and I'm so happy to be a guest designer for the day over at Jaded Blossom. I can't wait to share my project with you. 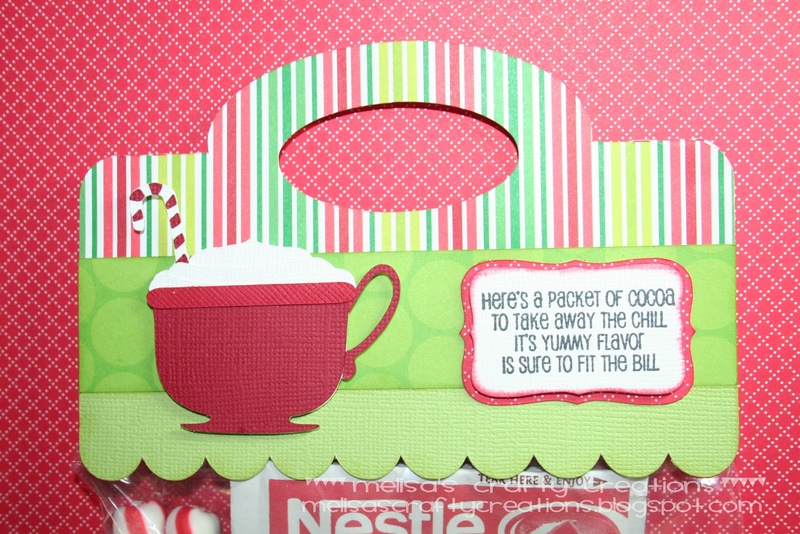 Today I will be featuring the Hot Cocoa Stamp set. I thought it would be to make this to hand out to the teachers at my son's school for Christmas. To make the topper I used Pretty Paper, Pretty Ribbons Handled Treat Bag. For my sentiment I used the Hot Cocoa stamp set. The Cup of Cocoa is from SVG Cutting Files. 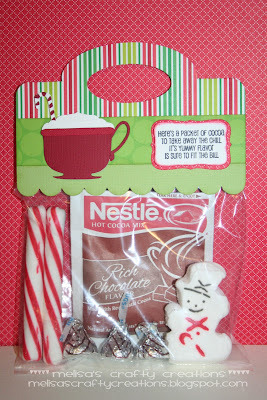 how adorable is this treat bag!! LOVE the snowman and his cute face...LOL!! Perfect sentiment and love the cup of cocoa cut! What a cute little treat! 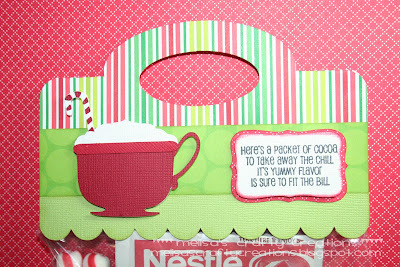 I love the mug and candy cane - too cute!! What a great gift! I love that it's so cute, but would also be easy to make many at a time for teachers or neighbors. Great idea! THis is soooo cute Melisa!! Love the hot cocoa! This is Adorable Melisa, What a great stocking stuffer! This is so cute!! I love the peep!! Such an ADORABLE cocoa set! I love the colors. I am sure the teachers will LOVE them! super cute...thanks for sharing it!! What a cute treat bag! Love this treat bag! So cute! This is just too cute!! Love it! Love your project Melissa, the handle to hold the package is great. And that snowman marshmallow - too cute. Thanks for sharing. love the handle treat bag, such a great idea! thanks for sharing. I love this treat bag! What an awesome job! OMG...Melissa these are the cutest gift bags! I love this as soon as I saw it on the sneak I had to make it for my kids classes! What a super clever idea, Melisa! I love the cheerful colors and clean lines. You're such an asset! This is so cute what an awesome treat. Love this! Great little gift. Love it! What a great co-worker/teachers gift! This is a great gift idea. I love how you staged the items in the bag and the snowman marshmallow is too cute. One of the cutest snowman soup sets I've seen so far :) Thanks for sharing. What a great idea!!! Fantastic job! what a cute idea! I love the snowman marshmallow peep! Great job Melisa! Really cute topper! Thanks for sharing! Adorable cocoa topper treat bag! Sweet idea! Now I want a cup of hot chocolate:) You ROCKED it. TFS and thank you so much for being a guest designer. Very cute--I like the cheery colors. oh this is cute, my daughter and i are adding cocoa gifts in our gift baskets and want to do each one different, this is perfect thank you ! This looks like a fun set to play with. Your gift bags look yummy. Too cute. I just love the colors. Very cute! I made something similiar last year and everyone loved them! I bet his teacher loved it! I love this project! This is a great teacher's gift! what a cute little gift idea! Awww, this is just tooooo cute!! Thanks so much for sharing! Mmmmm...what a yummy little treat! Love the colors and everything about it!